Division One leaders Norwich came from behind three times before triumphing. Neil Wood's free-kick put Burnley ahead but Mathias Svensson equalised with a tame shot through David May's legs. May turned in Robbie Blake's corner at the far post to restore Burnley's advantage before Darren Huckerby tucked the ball in from a tight angle. Blake fired in from a Glen Little flick-on but Leon McKenzie headed an equaliser, Svensson nodded in another and Huckerby scored from close range. Burnley's opener came after only seven minutes but after Svensson had secured Norwich's first equaliser the visitors thought they had gone ahead. Svensson beat Burnley keeper Brian Jenson with a header but his goal was disallowed. Burnley were guilty of poor defending on a number of occasions and once May had restored their lead, Huckerby was allowed to round Jenson and score. But Blake's 21st goal of the season looked to have given Burnley the chance to grab a shock result. However, when Little was penalised for handball, McKenzie was left unmarked from a Huckerby free-kick and grabbed his 17th goal of the campaign. 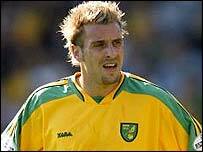 Svensson was also left unmarked for Norwich's fourth goal, while Huckerby struck with a minute remaining. Burnley: Jensen, Grant, Branch, May, Camara, Little, Weller, Roche, Wood, Blake, Ian Moore. Subs: McGregor, Chadwick, Abbey, Chaplow, Alan Moore. Norwich: Green, Edworthy, Mackay, Fleming, Drury, Francis, McVeigh, Holt, Huckerby, McKenzie, Svensson. Subs: Mulryne, Roberts, Crichton, Cooper, Henderson. Referee: A Hall (West Midlands).